Nadja Revnik: Wellcome Miss Munro! Finally a female surfer! For how long do you surf in SL? Buffy Munro: Since 2007! A long time now. Haha. Nadja Revnik: Is it your birthyear? Nadja Revnik: Did you start right away? Buffy Munro: But I joined SL in Feb and I didn't find surfing until about October. Nadja Revnik: Ah, ok ,-) How did you come to surfing back then? Buffy Munro: Hehe, was a fantastic place. I got on my first SL surf board that night. Nadja Revnik: Still got it? Buffy Munro: No, VW was on the beach and he lent me one. Couldn't believe you could do that in SL! Haha. Nadja Revnik: Ah, heh, same here...as well got a board rezzed by VW, when I surfed the first time. But I can't remember which year I started. Nadja Revnik: Prolly too lazy. Buffy Munro: I very rarely left Majini after that. Nadja Revnik: Vibes was already founded that days? /comment Vibes is the team where my interview partner is team captain at. Buffy at new Vibes club house at Vibes beach. Nadja Revnik: And what makes SL surfing special for you? Buffy Munro: It was always the people really....I have enjoyed competing in the past but I get dead nervous! Just the people I have met have made it so special. Buffy Munro: A lot of people come and go, but certain ones remain ....I was just thinking last night that this is going to be the 4th Christmas that I have known certain people here. Nadja Revnik: Lol. Does your clicker surf as well? Nadja Revnik: Lol. The RL person behind your avatar. Buffy Munro: Oh real me. ROFL. Bit slow...haha. Nadja Revnik: Well, fun is most important, eh? Buffy Munro: I am more balanced in SL.Lmao. Nadja Revnik: Heh. What is the job of a team captain? Buffy Munro: I recruit, be there for them all, pick scoring surfers in the comps, as only 5 can count for team points, attempt to have meetings that usually turn in to a party! Buffy Munro: Haha. Always happens. They are a great bunch of people. Buffy Munro: Vibers really is about the fun. I would never ask them to do anything, if they don't want to compete, it doesn't mean they are not on the team anymore...my little family. Buffy Munro: We are a small team and we won this season! Wooohoo!!! Hahaaa. I've waited ages for that moment. Nadja Revnik: The whole season? Great! Nadja Revnik: Grats on this! Nadja Revnik: And saturday you will be honored? Buffy Munro: Yes! I have to accept the trophy, hehe. Nadja Revnik: Heh, hope you ate enough. 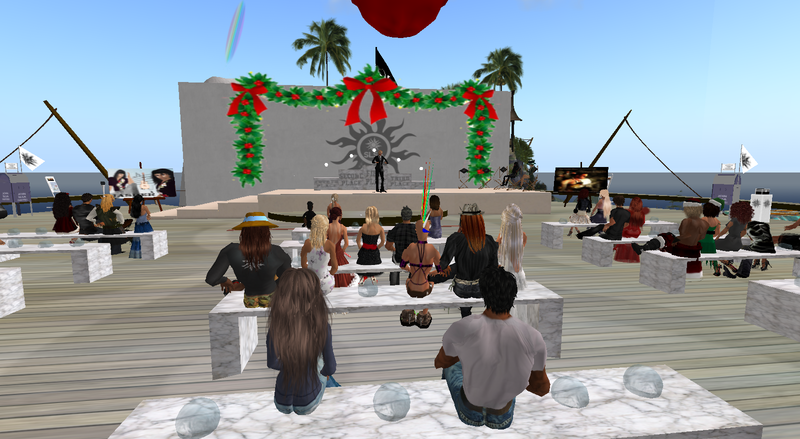 Nadja Revnik: And I have a last question as well: why do you think people engage in sports in SL in general? Buffy Munro: Personally, as I said before I did it because I got hooked on the people...I can't speak for others....freedom maybe? They are able to do something they couldn't necessarily do in RL. Nadja Revnik: Thanks for the fun interview Miss Munro!